Christmas is normally a time of returning to places and visiting familiar faces, of being back and coming home. It's mostly about well-known things, old traditions - somewhat melancholic and rarely surprising. As a little contrast to the (in the best way) predictable character of Good Old Santa Claus & Co, we are more than happy to give away something really fresh, something very new: one signed (!) copy of Keep Campings debut album "Transport" which saw the light of day only yesterday, on 9 December 2013. “We travel to the future in despairing thoughtfulness and return back again to the very beginning where the backbeat was first conceived and pummeled into submission by a dusty electrified guitar. After an inspirational tour to the 70’s, where the synthesizer caught up and became a fixture within every band who wanted to survive the decade to come, we settle on the american prairie, where the big questions about life, death and love are abundant. With respect for the past and eyes set on the future, a band slowly takes shape...” - The stunning self-description of Keep Camping pictures "postmodern songs from a restless mind", dark, moody soundscapes, music-made eeriness, intense drama, rythmic pop, folk elements and sharp synthesizers. After only existing since 2012 and successful live appearances, they earlier this year won the so-called Fatter Eskil Prisen - a competition among 24 upcoming bands, set up by the Aarhusian venue of the same name. With their debut album "Transport" in our hands, we are looking forward to following them into the new year! 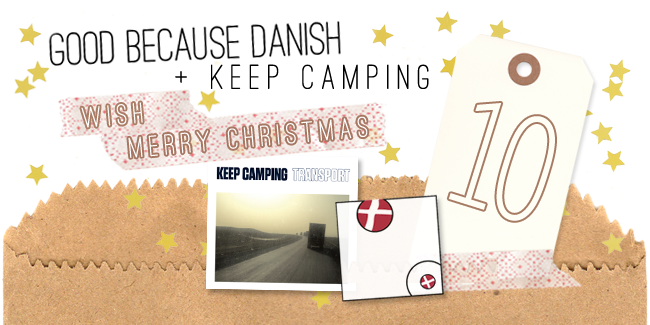 Write a mail with the subject "Christmas Countdown: Keep Camping" to goodbecausedanish@gmail.com and tell us where you would love to travel to for Christmas! Don't forget to also include your address into the mail. Deadline is 20 December 2013.